Get those little ones climbing, crawling and sliding with a toddler playground from Kidstuff Playsystems. With events designed and sized just right for the growing toddlers in your family daycare or preschool, you can promote development of motor skills, coordination, social skills and many other important life skills. A ramp and large steps leading up to the main platform enable even children as young as 18 months to enjoy this playground set. A shade roof over the main platform keeps kids cool in the hot sun. 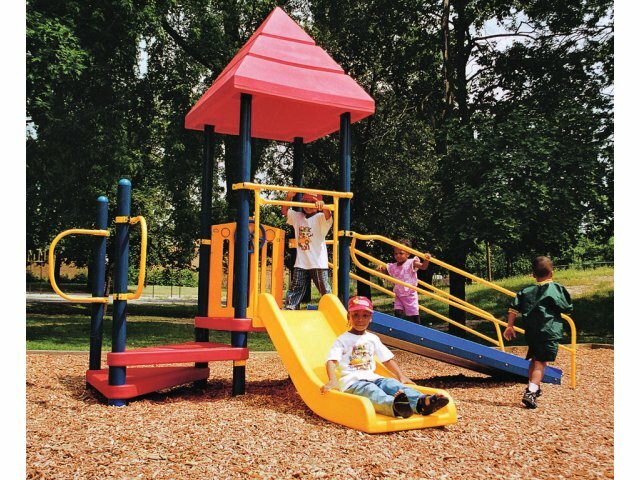 With so many fun things to do, you want to be sure that your toddler playground is built for heavy wear and tear. The rotation-molded platform will not rust and the fade-resistant components will maintain their luster through many years of enjoyment. If you want to encourage children to enjoy the great outdoors while developing important skills they need for life, a toddler playground is just what you need. 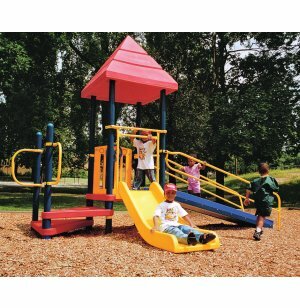 Fun Fitness: Includes a crawlway, slide, play panel and steps. Shady Play: A roof over the main platform keeps kids cool, even when it’s sunny out. Inclusive Equipment: Includes an ADA transfer point. Meets all ADA guidelines.